Acer has unveiled a new version of its Iconia Tab A500, coming with 16GB of internal storage as opposed to the original model's 32GB. It also comes with a shiny new price tag, available for £350 – that's undercutting the 16GB iPad 2 by £50. 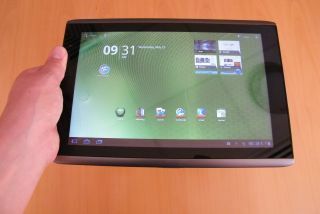 The Iconia Tab A500 is an Android Honeycomb tablet, and the new iteration still comes with a 10.1-inch display, 1080p output, HDMI port and aluminium casing. With a dual-core Nvidia Tegra 2 processor, it should still provide the solid 3.5 star performance that we evaluated on the 32GB model in our official TechRadar review. Sadly, the tablet's bulky design, which we weren't very impressed with, will also be present and correct in the memory-light model. But if you're after a bargain Android tablet that can still deliver the goods, the 16GB Acer Iconia Tab A500 could be a goer.